This is the same kind of service you would have spent $50 for on other sites. Your will get quality traffic to your site/offer and you will high quality leads. This works best for a squeeze page. BEST ADVERTISING & MARKETING: BLAST YOUR ADS TO 199K SAFELIST MEMBERS with PROOFS!!! 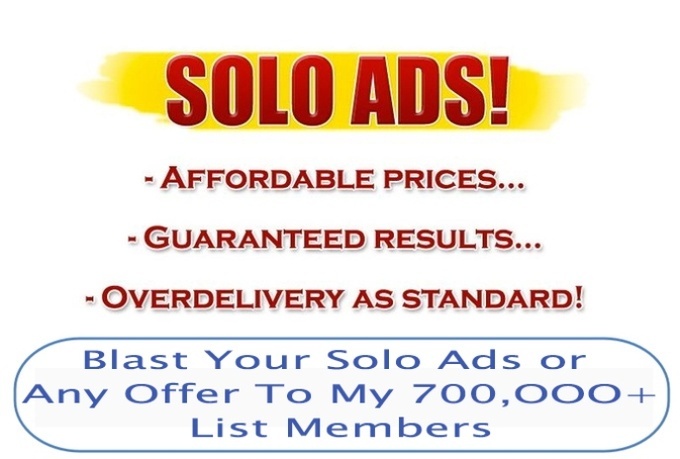 We will Successfully Double Send your Email, Solo Ads or Message To Over 199k Members. Your Ads, Message will be Promote and Broadcast to Target Niche List FOR 7 DAYS. We have a lot of experience when it comes to CONVERSION and delivering quality solo ads. FAST DELIVERY WITHIN 24 HOURS ORDER NOW!! Is there any Bonus Attached To This? Yes! Definitely we have some bonus attached to this service AND another superb awesome Bonus that is meant for people that goes for extra service. Can you guarantee leads? Please be informed that there is no guarantee on sales/opt-in and leads as solos are one time advertisement and humans behavior is unpredictable. How many can I order for at once? You can order as much as possible. We are available to serve you.Free Customer Care. Thanks you can inbox for more information or Click the ORDER BUTTON now!